This real estate sign is a terrific sign frame for property sale advertisements. 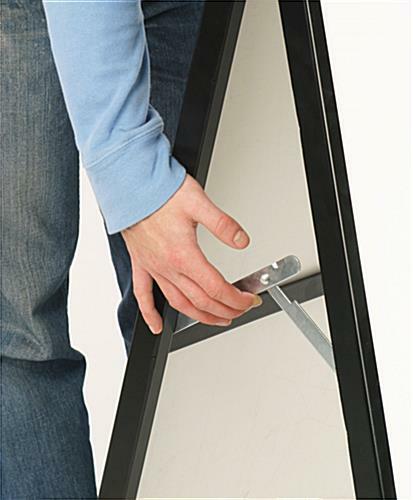 The real estate sign features a heavy-duty 3/4" angled steel frame, which prevents the sign frame from tipping over in heavy winds. 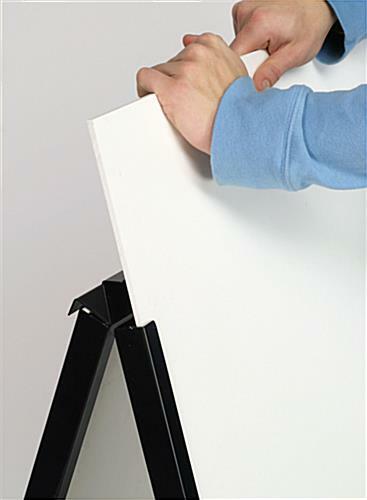 Real estate signs, also known as property signs are powder coated black to add a sharp, professional look to sale advertisements. For your convenience, the real estate sign comes fully assembled and ready to use. 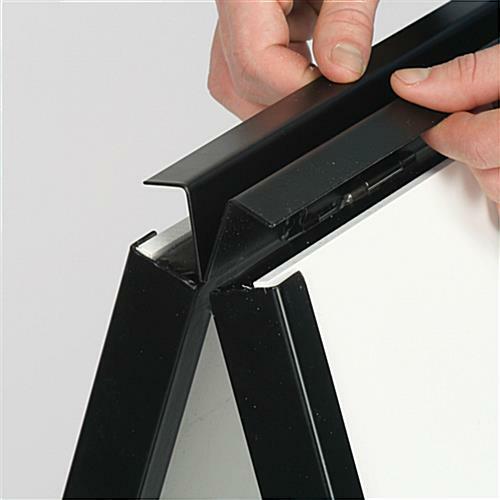 Real estate sign frames are supported by two metal hinges, which fold down so that the unit may be collapsed and stored when not in use. When folded, the real estate sign has a slim profile of only 2-3/4", making it easy to store the yard sign virtually anywhere. 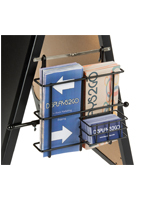 With the double-sided real estate sign, you can display 2 different advertisements in the same sign holder. 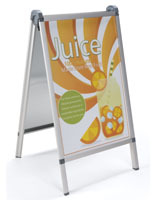 This gives you twice the exposure of ordinary sign frames! Each side of the real estate yard sign can accommodate a 23-1/2" x 35-1/2" graphic with 22-1/4" x 34" of viewable area. 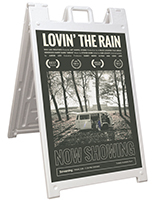 Please note that the real estate sign does not include a plastic protective lens, leaving your displays exposed to rain, snow, and other natural elements. For this reason, we recommend using either Coroplast or Sintra (expanded PVC) substrates with UV printing, silkscreen, laminated, or vinyl graphics. Graphic exchange is made easy with the real estate sign's simple slide-in design. 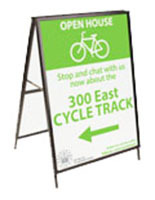 The real estate sign includes a poster-securing channel, which can accommodate signs up to 1/4" thick. 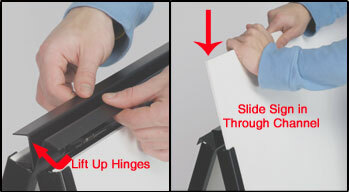 To change out signs, simply lift the hinged top cover and slide your poster in or out of the sign holder channel. 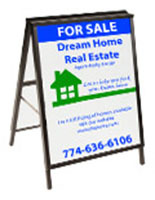 Great for realtors, the real estate sign is a great yard sign for sale, lease, and rental advertisements. 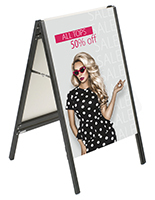 Grab the attention of roadside traffic with this sturdy and attractive iron-frame real estate sign. Thank you so much for your feedback! We're glad that you found our sidewalk sign to be attractive and easy-to-use, but regret that it was damaged during shipping. We would like to make this right for you, and our customer care team will reach out to you shortly to assist. Thank you for bringing this to our attention. 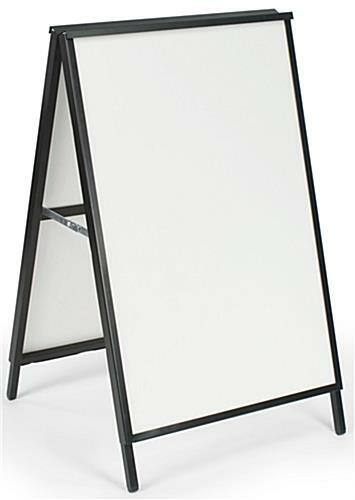 The stand looks really sleek, with clean lines. 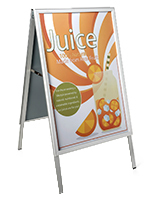 The sign frame is easy to load and unload with different printed signs. And easy to move around, not too heavy. Happy with my purchase. Thank you so much for the wonderful review, Liz! 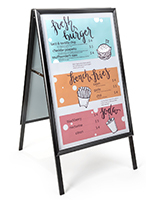 We're so happy to hear that you find this sidewalk sign to be well-built and easy-to-use — the slide-in channels definitely make the process of changing out your signage simple and easy. 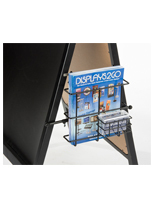 We hope you'll continue to turn to Displays2go for your display needs! 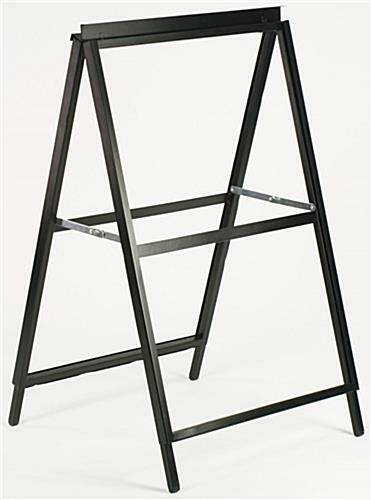 We've purchased 6 of these holders for our church to use on Sunday mornings outdoors. They are heavy enough they don't blow over, but look nicer than the plastic water/sand filled ones. They also look nice enough to use indoors if needed. We print the inserts locally and haven't had any issue with them. Great addition to our signage arsenal. Thank you for the excellent review, Adam! We're glad that you've found our sidewalk signs to be a sturdy and attractive outdoor solution for your church's signage arsenal. 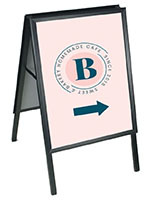 If you ever need new inserts, check out our durable coroplast signs! I am quite pleased with this product. I think it will be perfect for our needs and the price was good. Thanks, Diane! We're glad that our sidewalk sign is perfect for your needs. Please feel free to let us know if there's anything you think we could improve — we always appreciate our customers' feedback! We're using these outdoors, and some of our plastic ones tend to get knocked over and since we have to move them around we don't want to add a ton of weight to keep them in place. 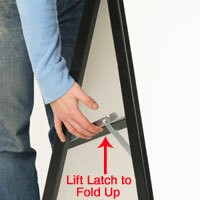 These holders are heavy enough to stay where we put them, but can be moved easily. Great product for the price. We love hearing this, Adam! Thanks for the great review!